Here's some fancy ideas to spruce up the Thanksgiving table. Put a child (or group of children) in charge of the napkins this year. 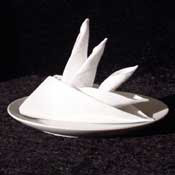 Click HERE for 26 other ways to fold a napkin.